But the pace of change is very unlikely to stay the same as the economy transitions through the fourth industrial revolution. Speculation is rife on the automation of labour markets. Some predict that robots will displace both low and high skilled labour, leading to massive societal and economic repercussions. Others think that myriad new opportunities in the brave new world will open endless possibilities for self-realization and entrepreneurship. Experts agree only on the massive scale of the change afoot and the need for adaptation by businesses, public policy and individuals. What is missing from the debate is a gender lens. Who will win – robot, man or woman? First, we need to know if female-dominated or male-dominated professions are more likely susceptible to automation. At the World Economic Forum we surveyed Chief Human Resource Officers and Chief Strategy Officers on the future of jobs, including gender dimensions. If the recent economic downturn was a “mancession” it’s clear that the fourth industrial revolution will have an impact on both women and men’s jobs and livelihoods. In the coming revolution, job losses are most likely to be concentrated in manufacturing, construction and installation roles – all male dominated jobs – but also in sales and production roles that are typically dominated by women. These roles cover everything from call centres in emerging markets – jobs that created an entirely new source of livelihoods for first generation young female workers – to retail and administrative roles in developed economies that are a key employer for lower-middle class women. If these losses do occur, there will be a negative impact on single income households headed by low-skilled women, collective earnings in dual income families and ultimately will exacerbate national income inequality. What about new opportunities in this transformed labour market? This question is much more complex. So many new positions will emerge that we cannot imagine today and non-technological factors such as demographic pressures, cultural norms and geopolitics will also further reshape the business and talent landscape. While we cannot predict these new roles, we can reasonably assume there will be growth in areas that help build upon technological progress or in areas that fill in the gaps left by these technological innovations. Computer science, mathematical and engineering professions are dominated by men in most developed and emerging markets – and the “brogrammer” is set to do well in the future labour market as the demand for these functions grows. However, demand will also grow for those roles that tend to be associated with caregiving, roles that machines cannot yet play. These include therapists, interpreters, lifestyle coaches, event planners, nursing, psychologists, personal care aides and other roles in healthcare, roles that are often dominated by women. Will the gender gap get worse? So will this industrial revolution exacerbate the already existing gender gap? While it seems highly likely that male and female-dominated jobs will be equally displaced, we will also likely see further divergence between “men’s roles” and “women’s roles”. This divergence has implications for overall growth – and for the individuals concerned. At the moment, in 100 countries women make up the majority of those in university – so the bulk of the next generation of high skilled talent is female. It will be more critical than ever before that these women can leverage their talents in the workforce during the fourth industrial revolution. In addition, the diversity dividend is the premium associated with diversity, particularly when organizations address complex and creative tasks. In the next wave of technological change, innovation, collaboration and creativity will become more important than ever and companies cannot afford to lose out on the benefits of gender-balanced teams. And finally, a divergence of male and female roles is likely to lead to wage “ghettos” if women’s work continues to be valued less than that of men, having wide ranging implications for individual earnings, families and national income inequality. Labour policy and business practices are often still designed for family and economic structures from half a century ago, when there was a traditional delineation between breadwinners and caregivers. That world no longer exists. Dual-income households are the norm. In addition, households headed by just one parent – often women – are also more present than ever before. Policymakers and business leaders need to adjust to these current realities before the next wave of disruption hits and they are left even further behind than they currently are. And individuals – girls and women – need to prepare with skills and training that is relevant to the jobs of tomorrow, especially STEM fields where women currently make up only a third of students globally despite their overall dominance in higher education. 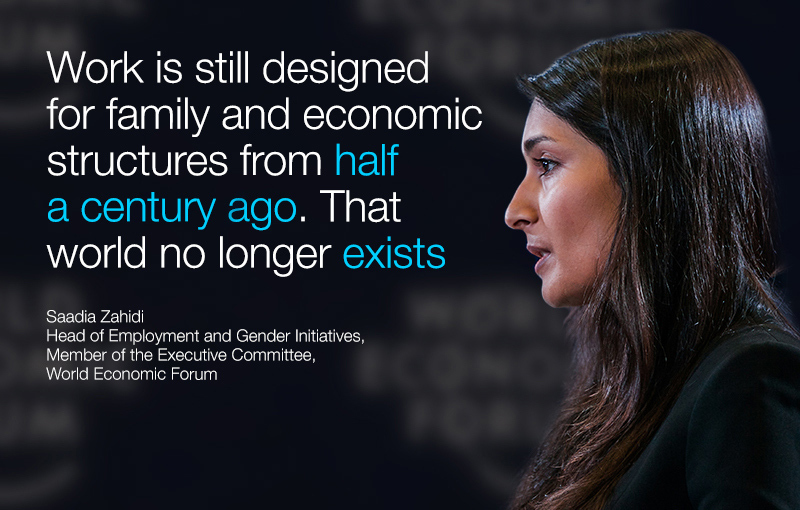 Whether women or men lose more – or gain more – will depend on many factors we can’t predict today but it is clear that the fourth industrial revolution will impact men and women differently. It is also clear that all efforts at adaptation – whether carried out by regulators, policymakers, business leaders or individuals – must take these gender distinctions into account.